The St Patrick’s Day 5K lived up to its hype as Canada’s most competitive 5K, despite the late withdrawal of several top entrants. 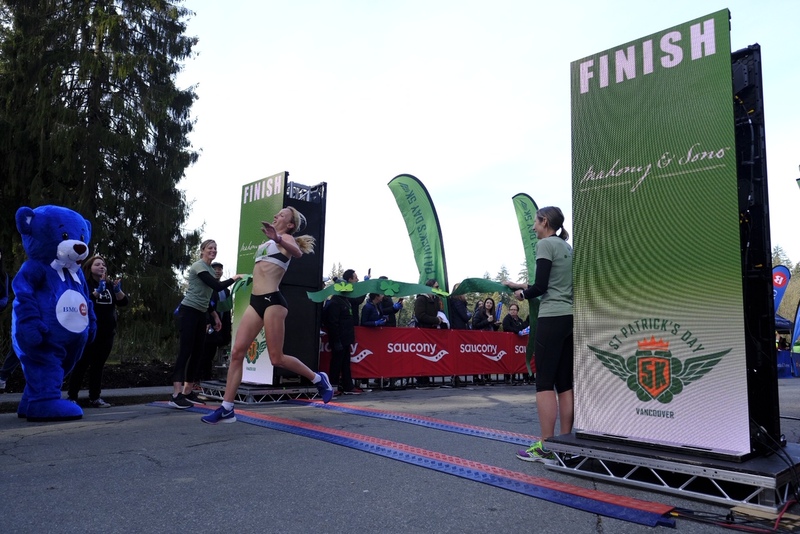 Transplanted Scot, Sarah Inglis, broke the Canadian All-Comers record set by Natasha Wodak as last year’s race. Inglis ran a stunning 15:29, with Wodak also 3 seconds under the old mark having to settle for second in 15:36. Wodak’s consolation was an F3539 Canadian record, and the BC Championship. Event record prize money was also paid out on the men’s side, as John Gay clocked 14:06, the fastest 5K ever seen in BC, also earning him the BC Championship. Justin Kent out-leaned Kieran Lumb for third, both finishing in 14:13, just a second outside the old record set by Luc Bruchet last year. Run in perfect conditions, the downhill first 400m, plus bonuses on offer to the leaders through the first mile, ensured a fast pace from the outset. Justin Kent won the mile bonus in 4:20, marginally ahead of Gay, with a 40m gap back to Lumb leading the pack in third. The women’s mile was even closer, taking a photo to separate American Shalaya Kipp from Inglis, in 4:44, with Wodak a second behind. Kipp faded from that point on, but still held on to third at the finish. Last year the top 75 finishers broke 17 minutes. That record too was broken, as this year the top 76 broke 17.